070814: Kanikapila at the elks lodge this Friday . . .
Aloooooha UFOhana! Sorry for missing last week’s post. It was definitely an action packed week, as some of you may already know. Anyway, thought I’d better get this out sooner than later. We’re in the Elks Bar this Friday. Runtimes 7pm – 10pm. Same setup as before, here’s the menu for Friday Night from Brudda Joe and Brudda Tad. Joe and Tad’s Lunch Wagon will be serving up the following dishes this Friday…. Dinner starts at 6:30 …$10pp…no RSVPs required, however we serve til it’s gone. Isn’t cool that Joe mentioned about bringing their Ukuleles? Nice. Here are images from the past two week’s events. Click on the collages below to view the photo albums. Enjoy . . .
062714: Kanikapila at the Elks . . .
062814: Hula Mai Ho’ike – Event is opened with a 2 hour Kanikapila by the UFOhana, followed by Hula Mai Ho’ike . . .
On the 4th we were off on an Away Mission to the Alano Club FOJ BBQ . . . .
070514: Away Mission to the Happiest Fair On The Earth . . . Mahalo Donna for all the great photos! 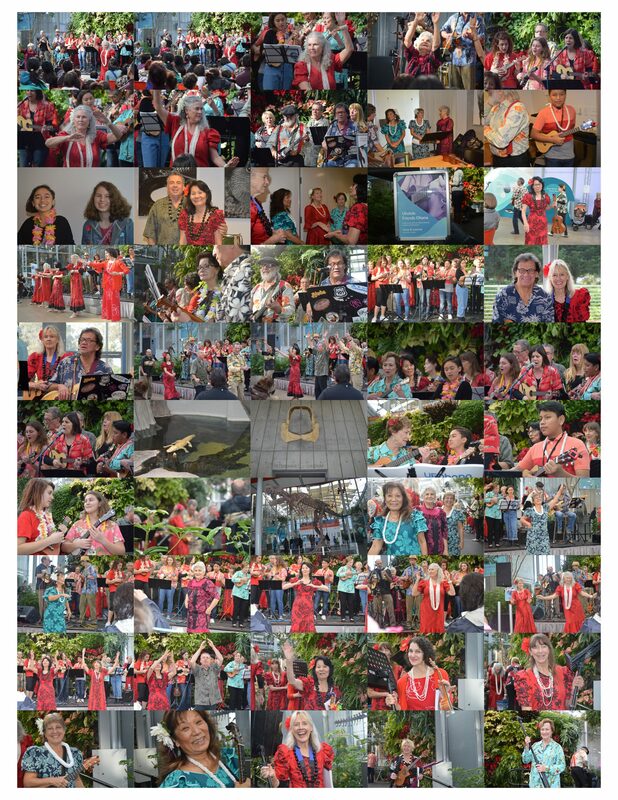 Also, Marion would like to extend, on behalf of the Marin Cultural Center, her Mahalo Nui Loa to the UFOhana for a great and well received performance. On behalf of Nohea and Myself, I would like to say that we consider ourselves so blessed to be part of such a wonderful and caring ‘Ohana . . . Me Ke Aloha Pumehana Ka Kou . . . and I am honored to be with you all. The following day I paid a visit to the Elks Fund Raiser, The Elks Beer Booth, here a scenes of the Booth and my stroll about the Fair. . .
Ok, I’m running out of steam . . . time to moe moe . . . Horizon a glow . . .
062514: WE’RE AT THE ELKS THIS FRIDAY . . . Sounds delicious! Btw, all funds from these dinners are used towards Non-profit endeavors by the Elks. Grinstead Amphitheater ,Sonoma Plaza, First St. East Sonoma, CA 95487 and their poster below. Interesting to note the the Mayor of Sonoma actually declared the day of the event as Hula Mai Day. Cool huh! Also note that the event is FREE. I think we need to get a grass roots movement going declaring a day as “Strum and Ukulele Day” . . . . what say ye? Btw, did I mention the event was FREE? Ok, I don’t have any photos from last week’s UFOhana Events so I’m sharing these, “Ukulele Sightings” as I call them for your amusement . . .
An Imperial Land Walking Uke? Would make a great Gig Car, though parking one would be a hassle . . . If Albert was alive today . . . Theory of Relativ(ity) tuning? I AM THE BAT (UKE) MAN! Who says playing an Ukulele doesn’t build muscles? Ok, maybe lifting them does . . . . I think Jon mentioned that playing one for 30 minutes burns a 120 calories. Hmmmm, I wonder is that was for a Soprano or Baritone? Sandy and Del . . . when they were in their “Bad Boys of Uke” phase . . . . Yes that is my son Lucas on the far left from a few years back. We were down stairs walking around Ala Moana shopping center and heard a group singing, “How Can I get Over”, in falsetto, sounded like we were in Church. We followed the trail of notes upstairs, ended up near Long’s Drugs, and found the Uncles singing their hearts away. Btw, there were no Rent-A-Cops on Segways chasing them away . . . . something you’d definitely see happen at a Mall near us . . . a whim o whey . . .
And lastly Jake and the –=SqL=- performing at Yerba Buena Gardens (toot, toot) . . . with the UFOhana . . . all arranged by Stevie B! Mahalo Nui Loa Stevie B where ever you are!
. . . and finally this very cool link from Jon and Debbie Cyr . . . Amelia (Rose) Earhart 2014 Around the World Flight! http://photos.mercurynews.com/2014/06/25/photos-pilot-amelia-rose-earhart-arrives-at-north-field-in-oakland-to-begin-flight-around-the-world-2/#1 . . . talk about Life Imitates Art Imitates Life . . .
Mahalo Jon and Debbie for this cool find. I think you’re right, there maybe yet another verse to add her song! See you folks Friday! Not sure where we’ll be in the Elks just yet, just check both places. Can’t miss us! Don’t forget to RSVP you dinners by Thursday. Oh, btw, the Hula Mai event this Saturday is Free! Did I mention that already?